The Deep Fall has arrived. Days are still sunny while the cool nights have turned the forests into riot of colors. It is time to go and pickup the last treasures what the nature has to offer, before the snow covers everything with white veil. 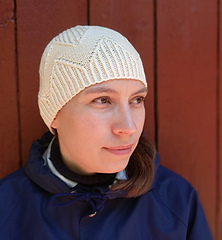 Mountains is made of soft and warm merino wool. Due to perfect fit it’s easy to wear under a hood, during windy days. 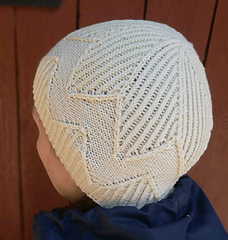 Twisted stitches combined with ribbing, forms a vision from majestic mountain range. The geometric pattern is easy to follow. A perfect peace for the beginner to challenge skills, but not too boring for professionals. Enjoy the knitting and the weather whatever it may be. Height: 8 inches / 20[22.5]cm. Circumference: 18 inches / 46cm, unstretched. Will stretch to comfortably fit head circumference up to 22 inches / 56cm[61cm]. Yarn: Malabrigo Yarn Arroyo [100% wool - merino; 335yd/ 306m per 3.53 oz/100 g skein], 1 skein. 25 sts/36 rounds = 4 inches/10 cm in pattern stitch. 24 sts/33 rounds = 4 inches/10 cm in stockinette stitch. The English pattern is available though Knitty Magazine. 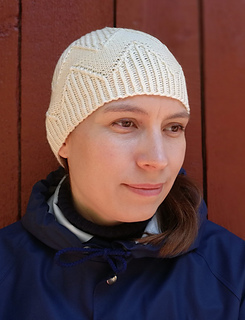 Alkuperäinen ohje on julkaistu Knitty Deep Fall 2018-verkkolehdessä. Suomenkielinen käännös on ladattavissa Ravelrystä. Ympärysmitta: 46cm, venyttämätön. Sopii päähän jonka ympärys on 56cm[61cm]. Lanka: Malabrigo Yarn Arroyo [100% merino villaa; 306m per 100 g kerä], 1 kerä. Puikot: 3mm sukkapuikot sekä 40cm pyöröpuikko. 25 s / 36 krs:ta = 10 cm mallineuletta. 24 s / 33 krs:ta = 10 cm in sileääneuletta.